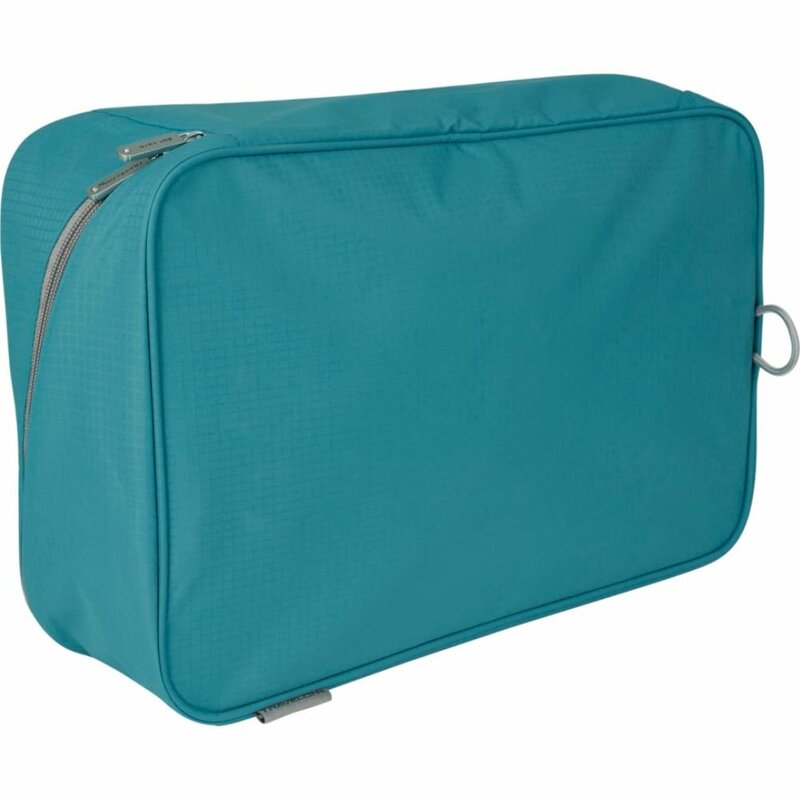 If you’re into being totally organized when you travel, then you probably have packing cubes. I don’t use them for all my clothes, but I do like to use them for things like undergarments, swimsuits and having an extra outfit on-hand when we take a road trip or just in the car while on vacation. I love being able to just grab the cube and go or toss it in the dresser in the room, so all the underwear stay in one place and don’t get lost in our stockpile of shorts. Having everything neat and easy to get to is important and helps to get out the door faster in the morning. If you are a packing cube user, then you know that you often have to have several different kinds to do everything you want. Travelon likes to be innovative and give travelers exactly what they need and want and so the multi-purpose packing cube was born. One side is like a regular cube, the other side has three mesh pockets and in between is a snap out zipper pocket. If you have fancy bras you always worry will get crushed in your travel bag, you need this packing cube. The normal side has a rigid flap that you can insert in the bottom, so it has structure to keep the cups of your expensive bras safe. Of course, my husband also said it would be fantastic for dress shoes when traveling. He’s not wrong, because in that case, you can keep the dirty bottoms of your shoes away from your other clothing and other stuff inside the packing cube, too. On my trip to Vegas, I used the mesh pockets for all my undergarments. My bras can easily slip into the pockets, and my carry-on was hard-sided, so I wasn’t worried about them losing shape. The normal side was where I packed my husband’s boxer briefs and socks. It is large enough to fit at least five pair of underwear and three or four pair of socks. That great little snap-out envelope was the perfect size for our swimsuits and waterproof phone pouches. When we headed over to visit family, we knew they would want us to jump in their pool, so I pulled that pocket out, added a tube of sunscreen and a plastic bag – to put our wet suits into when finished swimming – and tossed it in the trunk. We were easily prepared and didn’t have to carry a soggy bag back, because I just stuffed the plastic bag back into the snap-out pocket. When coming home, you could definitely use it for putting dirty clothes and keeping your clean stuff odor-free. Business travelers could use this handy pocket for ties, so they stay flat. Obviously, there are a lot of ways to use your packing cube. You could use it to pack your baby needs, like diapers, extra clothes and toys, or snacks or use just one side for unmentionables and the other side for accessories. Because the cube is lightweight, it won’t take up more room in your bag than necessary or add extra weight. If something liquid makes a break for it in your bag, your cube is water-resistant, and will keep the insides dry and undamaged. When you get home and put away all your stuff, the packing cube folds flat for convenient storage. I love the colors that the cubes come in. You can get classic black or bright colors that are easy to see in your luggage. 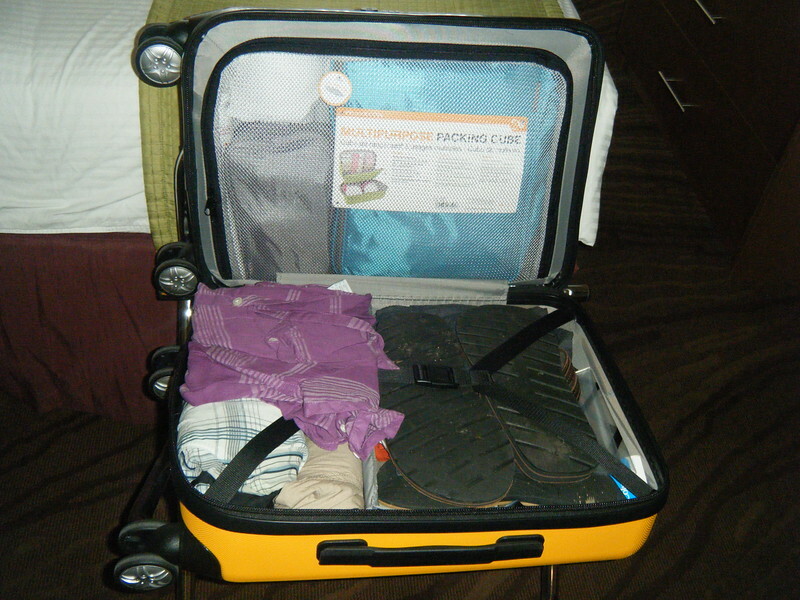 Do you use packing cubes when you travel? Disclaimer: I received the Multi-Purpose Packing Cube from Travelon for the purposes of this review, but all opinions are 100% my own.